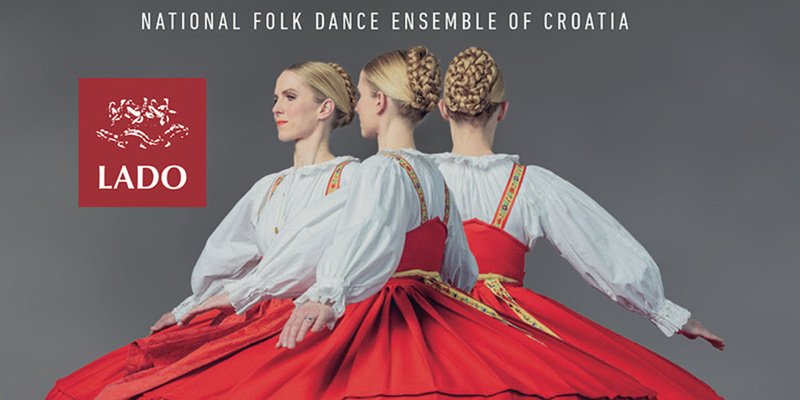 Celebrating upcoming 70th anniversary, the National Folk Dance Ensemble of Croatia "LADO" is touring the USA and Canada in October showcasing a completely new program, including some contemporary musical and dance works based on traditional motifs and elements. This performance is not to be missed! Founded in 1949 as a professional national ensemble, LADO presents the rich traditions of Croatian culture with exceptional dancers, singers and musicians performing authentic Croatian folk songs. Described as a "Dancing Museum" because of its priceless and beautiful authentic costumes, LADO represents the rich and diverse regional musical and choreographic traditions of Croatia, which is geographically situated at a crossroad of Europe in which the Mediterranean Balkan, Pannonia and Alpine influences are found in the dances, music and costumes. By Heather Desaulniers - Washington D.C. Though it is very difficult to reduce a two-hour performance to just a few thoughts, there are three words that best describe LADO: smooth, calm and joyful. ...Yet, what impressed me the most was the absolute elation that was exuded from every dancer on the stage. They radiated pure joy with each other, with the audience and with the dance. The pride was in their culture, not in flashy theatrical demonstrations; theirs was an intimate honesty expressed through a lineage of movement. EVENING NEWS LONDON An audience of 5000 certainly appreciated some of the most skillful and inventive performances of the national dance ever seen at the Royal Albert Hall. AFTENPOSTEN - OSLO The appearance of the LADO ensemble last Saturday as part of the Bergen Festival was a rich experience and a presentation of authentic folklore of the highest quality. No less important, let us also mention the exceptional, joyful life energy radiating from the ensemble. The numerous and exceptionally rich national costumes also brought much color and atmosphere to this performance. In short - it was folklore performed at the highest possible level. Performers that both dance and sing at the highest artistic level. Musicians who play a total of 80 different traditional instruments. Every LADO artist is both a dancer and a singer, which allows for versatility. Performances can be dance performances, singing performances and both elements together, all accompanied by the orchestra. More than 100 choreographies. An incredible diversity of dances, songs and costumes. Lado is a "dancing museum"
Experience the vibrant color and striking beauty of traditional costumes, some of which are older than 100 years and embellished with real gold, including jewelry made from archaic coins. More than 5,000 concerts in 48 countries. More than 30 records and CDs recorded at the highest production level. Excellent workshops and master classes. Many thanks to Cia Toscanini and Michael Spudic for submitting this information.